Availability of genetic diversity is important in selecting suitable cultivars for crop improvement. 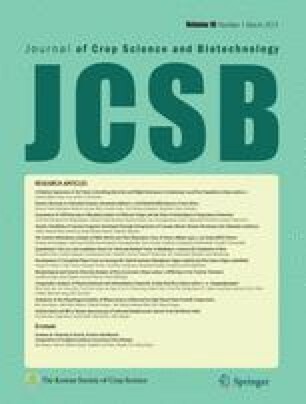 Progenies of crosses between 19 farmer-preferred cassava landraces and Cassava Mosaic Disease (CMD)-resistant cultivar TME 11 were evaluated and compared with their maternal parents to assess their genetic variability and genetic gains based on CMD tolerance, some growth variables and root yield. The combined analysis of variance for the traits showed significant genotypic differences amongst the progenies and the parents. Apart from a few instances, the differences in replications and years were also significant. Genetic variability components showed high heritability ranging from 92.3 to 99.6% and moderately high genetic gains of 54.1 to 99.6% for the parental cultivars. Apart from canopy spread and plant height, heritability and genetic gains of the progenies were slightly lower than the parents indicating high variability within families of the progenies. The phenotypic coefficient of variation was slightly greater than genotypic coefficient of variation indicating minimal influence of environment on the genotypes. For most of the characters evaluated, the mean performance of the progenies was higher than their corresponding parental lines. Although the genotypes differed significantly (P < 0.001) for all traits evaluated, cultivars such as Afebankye, Bosome nsia, Cedi bankye, 262 Debor, Kwadaso 25, Nkaakom 57 and Sisipe were found to constitute a pool of germplasm with adequate variability. The negative correlation between CMD incidence and other traits evaluated showed significant progress made in the breeding program.